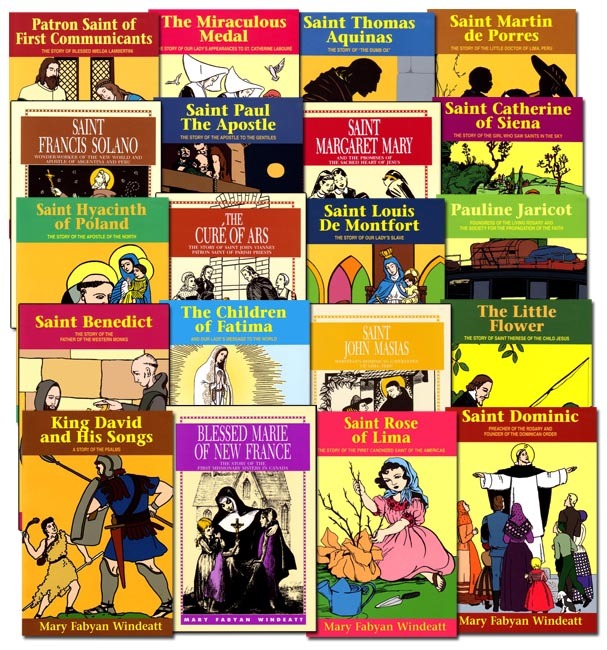 Includes all 20 books from the acclaimed set of saint biographies for students by Mary Fabyan Windeatt. The set includes St Thomas Aquinas, St Catherine of Siena, the Patron Saint of First Communicants, the Miraculous Medal, St Rose of Lima, St Martin de Porres, King David and His Songs, Blessed Marie of New France, Saint Dominic, Saint Benedict, the Children of Fatima, St John Masias, the Little Flower, St Hyacinth of Poland, the Cure of Ars, St Louis De Montfort, Pauline Jaricot, St Francis Solano, St Paul the Apostle, and St Margaret Mary. Appropriate for grades 4 to 8, but enjoyable for all ages. I read these as an adult and thought they were beautiful and detailed stories of the saints. She clearly portrayed the holiness of each of these saints. I read Blessed Imelda to my then 8y/o and it helped make her 1st Communion even more meaningful. She then read Little Flower in 7th gr as an assignment and she now feels she can really knows St Therese. She is a great childrens author.